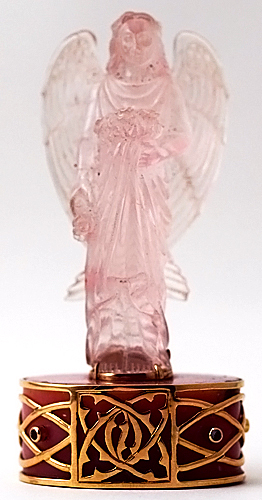 Dimensions (HxWxD): 3" x 1.5" x 1.15"
This gorgeous museum quality Rose Quartz, Pink Opal and Purple Tourmaline statue of Amarushaya, Angel of Blessings, was carved with loving care from a single large gemstone by Pedro, a world-renowned artist, jeweler and shamanic practitioner, who resides in Tokyo, Japan, and set in 22 karat gold. This remarkable gemstone altarpiece is both a Lightworker's power tool and a true collector's item. Note: Some of these photographs are taken with a camera with a closeup lens, so the camera sees more detail than the 'naked' eye. 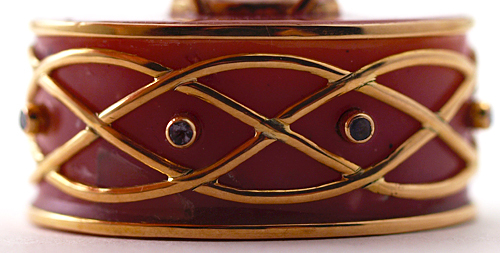 Some of the marks are natural mineral inclusions in the stone itself, not visible to the 'naked' eye. 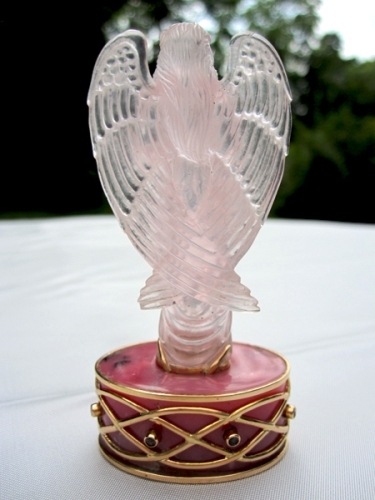 The Amarushaya Altar stands 3" inches high, and weighs two ounces. 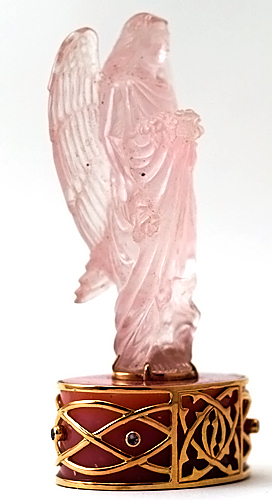 The rose quartz angel, depicted here offering a bouquet of roses in one hand and a single rose in the other to suggest a superabundance of spiritual blessings, is composed of a single 124.5 carat gemstone quality rose quartz carving, standing atop a 109.5 carat base of pink opal, measuring 1.5" x 1.1", laced with 7.9 grams of intricately carved 22 karat gold latticework, and is studded with 8 beautiful purple tourmaline gemstones. The value of cut crystal gemstones and collectible minerals has skyrocketed in the last five years, increasing as much as 1,000% in many cases, according to the November, 2006 edition of the Forbes Collector newsletter, and this beautiful specimen is truly a magnificent addition to any mineral or gemstone collection. During this time of global financial turmoil, many high net worth individuals and middle class collectors are buying gold and gemstones as a hedge against potential losses from currency devaluation, inflation and deflation. Because of the increasing difficulty of obtaining high quality gemstones on world markets it is quite likely that this strategy is a prudent step in diversification of one's investment portfolio. 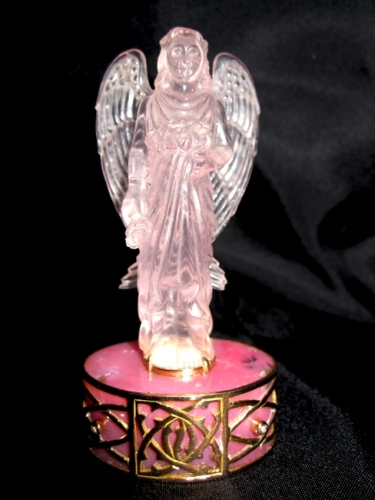 Amarushaya is an angel of the order of Cherubim, who are called Spirits of Harmony by Dionysisus the Aeropagite, in his seminal work, The Heavenly Hierarchies. In the Book of Genesis in the Bible, the Cherubim are Cosmic Guardians, set by the Lord to guard the gates to the Garden of Eden: "And he cast out Adam; and placed before the paradise of pleasure Cherubims, and a flaming sword, turning every way, to keep the way of the tree of life." In the Kabbalistic Teachings of the Wisdom Schools of the West, the Cherubim are said to dwell in the Sephiroth Chokma, the Abode of Wisdom, high upon the Tree of Life. 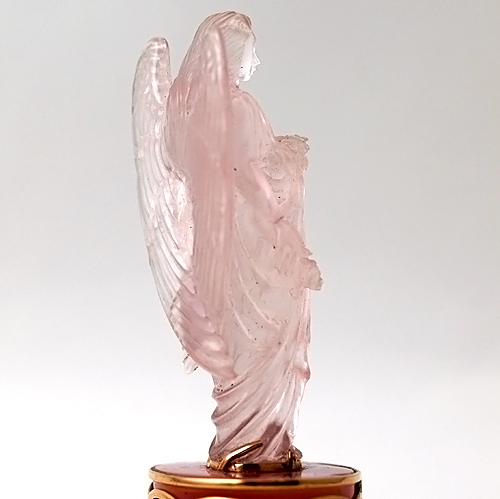 The Cherubim are the Angelic Source of Universal Wisdom, and their blessing confers the loving knowledge of Universal Truth and the Harmony of the Celestial Spheres upon those who open themselves to the energy stream from this exalted Angelic Tribe. "Wisdom, not acquired in decades, as is the wisdom of eminent men, but such wisdom as is gathered in thousands, nay, in millions of years of cosmic growth, this streams toward us with sublime power from the beings we call the cherubim," explains the eminent clairvoyant and philosopher Rudolf Steiner in his book Spiritual Beings in the Heavenly Bodies and in the Kingdoms of Nature. To communicate with the Cherubim, the aspirant is required to open the third eye chakra, and when that great intiation has been attained, the initiate will re-enter the Garden of Eden, and obtain access to the hidden Cosmic Wisdom under the Guardianship of these elevated beings of light. 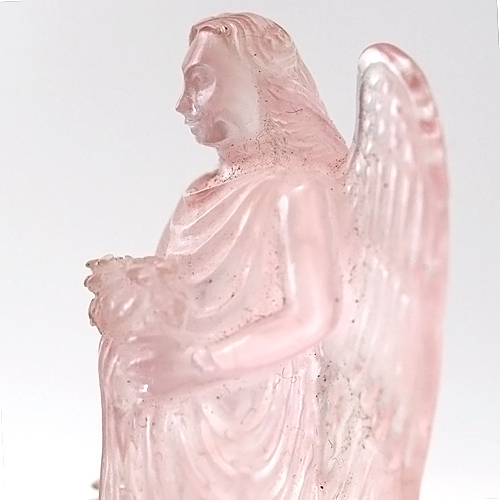 Amarushaya is the Cherubim who presides over Angelic ritual and ceremony, and the leader of a host of angels who bless the spiritual rituals and ceremonies of human beings, making this gemstone angel the ideal focal point for you own altar at home. The word opal comes from the Sanskrit word "upala", meaning "precious stone," and the later Greek word "opallios", meaning "to see a change of color." Opals are hard, very light and somewhat fragile gemstones composed of micro-spheroids of hydrous silica, and is never found in crystalline form, but rather in small veins, globules or crusts in rock formations. When these tiny microscopic spheres stack in an orderly fashion, forming a complex latticework structure, the play of light refracted through the latticework creates the various beautiful colors we associate with the opal. The size of the spheres and the cavities within the latticework determines the color spectrum that the opal exhibits to the naked eye. Peruvian pink opal ranges in color from pink and white to lavender and cream, and normally occurs in streaked massy formations which typically are rather opaque. Pink opal is considered to be a buoyant emotionally uplifting stone, which brings joy into one's life and energizes the heart chakra, opening the bearer up to life's highest and best possibilities. Some have said this precious stone induces a kind of beneficent euphoria which stimulates us to plunge into life more fully and accept life's difficulties and contradictions with grace and ease. Pink opal is also a meditation stone par excellence, opening the heart and awakening the functions of Higher Mind, helping the individual to quiet the mind by infusing the person with a joyous acceptance of life and of one's individual path of spiritual evolution. Fear, anxiety, worry and excessive mental machinations are then reduced and access to inner spiritual guidance expanded. Rare purple tourmaline, also known as Siberite, is among the most rare and regal of gemstones in the tourmaline family, and is associated with the crown chakra, which is assigned a violet or purple color in the Western chakra system. Siberite is a multi-purpose healing stone which promotes meditation, connects us to our true passion, and helps in the manifestation of our heart's desires, thus it is associated with both worldly success and accelerated spiritual development. 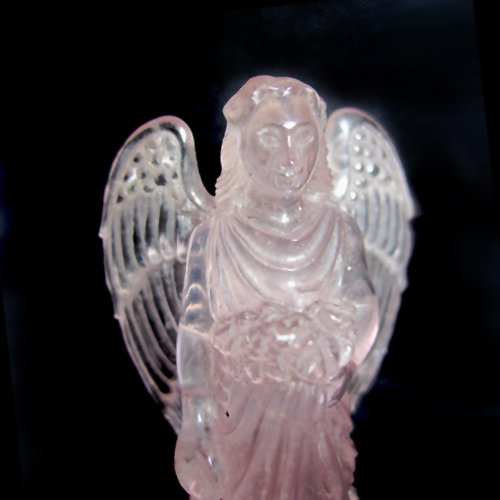 This gemstone angel altar has been cleaned and cleared with Universal Life Force Energy, the energies of sun and wind, and ancient Vedic mantras of protection, and given an energy attunement using Reiki, a Japanese technique of energy healing, so it will continue to receive and transmit Universal Life Force Energy direct from the Source of Creation. It has also cleaned and charged with the natural energy of sunlight. It is ready for you to program according to your own needs and desires. Weight above is shipping weight. Net weight is 2 ounces or 41.11 grams.